Khelo Khelo Rang Hai Koi Apne Sang Hai Bheega Bheega Ang Hai"
"Oh, Holi has arrived; behold! Holi has arrived! Play with colors, play with your companion, play till you get soaking wet!" Holi is a major Indian festival, celebrated during spring. 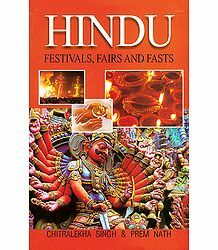 A Hindu festival by origin, this is one of the most popular events celebrated by all Indians, worldwide. This is quite popular even in countries such as Pakistan, Bangladesh and Nepal, where there is a populace of Hindus. Indian Hindu living in regions such as Malaysia, Suriname, Mauritius, Fiji, the USA, the UK and so on, too celebrate this occasion with great fun and fervor. Holi is referred to by many names in different regions of India. In Assam, it is known as Phagwah or the Festival of Colors. 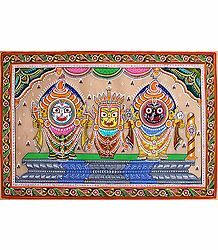 In Orissa, it is referred to as the Dolajatra and as the Basantotsav or the Spring Festival in West Bengal. Holi, though, is the most popular and widely celebrated in the Braj region, which connects closely to the life and times of Lord Krishna. Regions such as Mathura, Barsana, Nandagaon and most importantly, Brindavan, literally come alive with colors during this festival. They are also popular tourist destinations at this time of the year. There are several legends related to the Holi festival. We bring you some of the major instances in Indian mythology, connected with this occasion. Hiranyakashipu, the terrible King of the demons, seeking immortality, undertook a long and arduous penance to attain the grace of Brahma. When Brahma appeared before him, he requested him to grant this boon. However, Brahma stated that anything that was born had to die, and asked him to state another wish. Accordingly, Hiranyakashipu demanded that he should not be killed "during day or night; inside his home or outside; neither by man nor animal; neither on earth nor in the sky; and neither by ordinary or supernatural weapons". Brahma granted him the boon, after which, Hiranyakashipu grew extremely conceited and arrogant, in the knowledge that no one could ever cause him harm. He constantly attacked the earth and the heavens, demanding that people stop praying to God and instead, start worshipping and adoring only him. 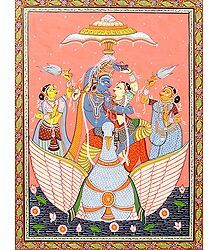 Hiranyakashipu had a young and handsome son, Prahlad, who was a staunch bhakta (devotee) of Vishnu. Though the former repeatedly warned the latter and threatened him with dire consequences if he should continue to worship Vishnu, Prahlad continued with his daily prayers. Hiranyakashipu tried to poison the boy, but with the grace of the Lord, the poison turned to sweet, nourishing, nectar! The demon King then ordered that the boy be trampled on by elephants, but Prahlad came out of it unharmed. He was safe even after being locked up in a room filled with poisonous snakes. Frustrated by the all the foiled attempts at killing his son, he ordered Prahlad to go seat himself on a pyre, in the lap of Holika, Hiranyakashipu's equally demonic sister. Holika had a boon that she would never be burned by fire and so, they lit a pyre on her. 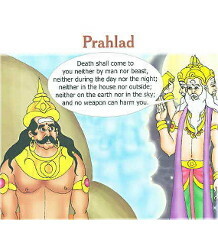 Prahlad prayed to Vishnu for his grace and meekly accepted his father's orders. To the surprise of everyone present there, Holika burned to death and Prahlad came out of the pyre without as much as a scratch. Holi is celebrated in remembrance of the evil Holika's death and Prahlad's salvation. This is also the reason why the effigy of a witch is burned during this spring festival. Holi festivities reach a feverish pace at Mathura, where Lord Krishna grew up. Here, the festival is celebrated for 16 days, until the day of Rangpanchami, the fifth day of the full moon. This is also when devotees pray to the Divine Couple, Radha and Krishna. The festivities officially usher in spring, which is regarded as the season for love. While Holi indicates the onset of spring, it is also celebrated as the season of harvest. This is the time the dreary winter ends, giving rise to multiple colors of spring, bringing in rich abundance of flora and fauna. Though this is celebrated as a religious event, this is probably the most vibrant among all rituals held all over the world. During this occasion, revelers create a bonfire, throw colored water and/or powder at each other, and celebrate with great fervor and enthusiasm. The main day of the Holi festival is called Dhuli in Sanskrit, as also Dhulandi, Dhulendi or Dhulheti. On this day, people throw colored powder and perfumes at each other. Bonfires are lit on vast grounds on the eve of this festival. These rituals are referred to Holika Dahan, to mark the slaying of the terrible demoness, Holika. This day is also referred as Chhoti (small or minor) Holi. Down South, Holika Dahan is referred to as Kama Dahanam. Holi falls on the last full moon day of the lunar month of Phalguna (February/March), that is, on the Phalguna Poornima day. In most regions, except in places such as Mathura, Holi is celebrated for two days. During this time, all social are relaxed and people mingle freely with each other, irrespective of age, caste, creed, gender, social status and so on. Men and women enjoy this day together; singing, dancing and making merry, thereby creating a lively environment full of fun and joy. 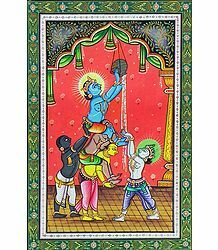 There are very early records of a festival similar to Holi called Ratnavali, where people sprayed colored water on each other with the help of bamboo syringes. However, the modern origins of the festival can be traced back to ancient Bengal, at the time of a Gaudiya Vaishnava festival. During this time, devotees visited Krishna temples and applied red Gulal (color powder) on the idol, also distributing the same to their family and friends, along with offering them Abir and the sweet Malpua, as Prasad (religious offering). Incidentally, the color red signifies the color of passion, as also Lord Krishna, who is the King of passion. This ritual, at that time, also signified that devotees should divert their earthly passions in order to attain the divine ecstasy of Lord Krishna's grace. In some parts of the country, the burning of old leaves and wood on the full moon night indicated the death of the old and the birth of the new season of spring, which in turn gave rise to new life in the form of new leaves and flowers. Some people even smeared their bodies with the ash, but this ritual, in due course of time, faded out, bringing in the Holika Dahan ritual in its place. Holi is celebrated in different ways in different regions of India. While some view it merely as an entertainment, Holi is a serious religious occasion for some others. Let us now see how this festival is celebrated in the major states of India. Jammu and Kashmir are equally concentrated with people from both the Hindu and the Muslim communities. In these states, both these communities celebrate the festival with great joy and verve. This is a high-spirited festival to celebrate the onset of spring and the season of harvest. People throw colored water and powder on each other, then dancing, singing and feasting together. The whole region comes alive during this time of the year, forgetting old rivalries and focusing on being together, celebrating this vibrant Festival of Color. The Kumaoni Holi, celebrated in the Kumaon region of Uttarakhand, is another ritual worth the mention. The specialty of this festival lies in the fact that it is a massive musical affair. This comes in various forms, such as the the Khari Holi, Baithki Holi and the Mahila Holi. The Khari Holi and the Baithki Holi are songs with great melody. 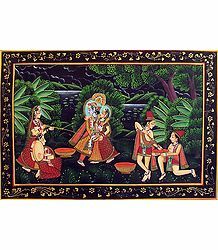 This type of Holi commences from the premises of temples, where Holi singers, or Holiyars, as they are referred to, gather together to start singing these songs to instrumental and percussive accompaniment. Based on classical Ragas, they are enjoyable, while also being spiritual in nature. Incidentally, the Baithki Holi is also known as Nirvan Ki Holi (the Holi of Liberation). Kumaonis are very particular to sing the Ragas as per the time of the day prescribed for them. Each Indian raga has a prescribed timeframe it has to be sung in and these artists strictly adhere to those rules. As against the Baithki Holi, the Khari Holi is mostly celebrated in the rural areas and this, therefore, reflects on the way it is celebrated. The people here wear traditional white churidar kurtas. They sing simple songs and dance in abandon, to the tune of simple rural musical accompaniments such as the Dhol and the Hurka. The Holika or bonfire prepared in traditional fashion is referred to as the Cheer Bandhan. This is prepared 15 days before the Dulhendi. This bonfire consists of a green Paiya tree placed in the middle. This Cheer is carefully guarded by the community, as rival mohallas or groups try to steal the others' Cheer. Barsana or Varsana, a district in Mathura, Uttar Pradesh, practically comes alive during Holi. This region is famous for its Lath mar Holi, which is played in the gigantic compound of the Radha Rani temple. This event is also a major tourist attraction of India. Several hundreds of people come together to witness the Lath Mar holi, where women beat up men with sticks, as part of the ritual. People standing by in the side start singing Holi Songs, chanting "Sri Radhey" or "Sri Krishna". The Holi songs rendered by the Braj mandal are sung in pure Braj Bhasha (language). While the women are busy trying to shoo away the men with lathis or sticks, the males give them a fitting answer as well. The men of the group sing provocative songs in a bid to invite the attention of women, all the time trying to protect themselves with shields. In Vrindavan too, this day is celebrated with a special puja dedicated to Lord Krishna. The festival in this region lasts for sixteen days. In Kanpur, this festival is celebrated for an entire week with color and also by setting up a grand fair called Ganga Mela or the Holi Mela. Revelers play Holi at various Ghats along the banks of River Ganga in Kanpur. The Ganga Mela is one of the most ancient of festivities and is over 150 years old. There is no bar on caste, creed, religion, gender and so on and people from all walks of life come together to take part in this massive congregation. Most offices, shops and courts are usually closed on the eve of the Ganga Mela and even political leaders join in the general fun. This event also marks the official end of the Festival of Colors in Kanpur. In Gorakhpur, which lies in northeast Uttar Pradesh, this day is celebrated with great fervor. The day begins with a special puja in the morning of Holi. The "Holi Milan" encourages unity and a feeling of brotherhood and people visit others' houses and sing Holi songs, also applying Gulal on each other. During the evening, people get together to prepare for the coming year, planning their major activities as per the Hindu almanac or the Panchang. In the Dhampur region of Uttar Pradesh, the Holi Hawas Jaloos is organized. This procession has been conducted since the past 60 years. Tens of thousands of people participate in this Jaloos, along with many bands and Jhakhi involving themselves too. Holi in Madhya Pradesh is fascinating, especially in regions such as Indore, where this festival is celebrated for five days, the last day being referred to as the Pancham Holi. It is believed that the Maratha Halkars, who had seized the state in the past, had cast their own influence of celebrating Rangpanchami, on the state. In Western Madhya Pradesh, the Bhil tribesmen celebrate the festival in their own special way. This community still adheres to ancient, pre-Hindu ways of life and this reflects on their Holi celebrations as well. In Rajasthan too, Holi is a veritable sight for the Gods. There is much feasting, dancing, singing and general merry-making on this day. 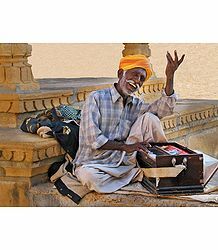 In the Jaisalmer town of Rajasthan, artists continue to play melodious music as clouds of colors fill the environment. Bihar too being in North India, Holi is celebrated with great fervor here as well. This occasion is referred to as Phagwa in the local Bhojpuri dialect. The above-mentioned lore of Holika predominantly features in this region as well. Similar to the other regions of North India, people light bonfires on the eve of Phalgun Poornima. In order to create the bonfire, they add in dung cakes, wood of the Araad or Redi tree and also the Holika tree, grains from the fresh harvest and unwanted and dried leaves. People also undertake the tradition of cleaning their entire house at this time. Everyone gathers in front of the Holika and the eldest member or a purohit initiates the lighting of the bonfire. He then smears others with Gulal. Starting early the next morning, the festival is celebrated with gusto in the morning, along with people throwing colored water and powder at each other, also singing and dancing away till lunch time. Folk songs are often sung at high pitch and people dance to the tune of dholak, ushering in the true joyful spirit of Holi. One star feature of the Holi festivities in this region is the consumption of Bhang, an intoxicating substance added to the drink, Thandai. Revelers also partake of delicious sweets and savories such as laddoos and pakoras. In some households, liquor is also consumed or added to foodstuff, along with serving up substances like ganja, which are aimed to get people on an ecstatic high. In Bengal, this festival leans more toward the religious and spiritual aspects. Early in the morning on Dol Purnima day, people dress up in white or saffron-colored clothing and wear flowers and/or garlands. Then they sing and dance to the accompaniment of musical instruments such as the veena, dubri, ektara and so on. Holi here, is also known as the Dol Jatra or Swing Festival. Unlike in North India, the festival is celebrated in a very quiet and meditative manner, by worshipping Krishna and Radha. The idols are placed in a beautifully decorated palanquin and are taken around the main streets of the village or city where the celebration takes place. As the procession unfolds, the men keep spraying colored water, gulal powder and the fragrant abeer at all passers-by. The head of the family undertakes a fast and prays to Agnidev (Lord of Fire) and Krishna as well. He then smears Krishna's idol with the gulal and offers "bhog" to both Krishna and Agnidev. In Shantiniketan, special dishes are offered to one and all, including delicacies such as malpua, basanti sandesh, kheer sandesh, payash, saffron milk and so on. The residents of Orissa or Odisha celebrate Holi in much the same manner as those in West Bengal. The only difference here is that they worship the idols of Jagannath, the presiding deity of Puri, instead of Radha and Krishna. Holi is also referred to Phakuwa in Assamese and is also celebrated during the Falgun month of the Assamese almanac. The main ritual connected to Holi in this region is the Dol Jatra, which is associated with the Satras of Barpeta. The Dol Jatra is celebrated over two days. On the second day, Holi is played with color powder and water. The residents of Barpeta sing devotional group songs on Lord Krishna. After this event, clay huts, which are especially prepared for this occasion, are burnt down, again signifying the legend of Holika. In the state of Manipur, the festival is celebrated for six whole days. Here, this occasion falls on the same day as their ancient, centuries-old festival of Yaosang. Traditionally, Manipuris first burn a thatched hut made out of hay and twigs. Young children go to each house in the village in order to collect money. This is referred to by the locals as nakadeng (or nakatheng) and is used as gifts on the first two days. At night, youths get together to perform a group folk dance called Thabal chongba. This happens on the full moon night of Lamta (Phalgun). Traditionally, revelers danced under the moonlight, to the tunes of lilting folk music, accompanied by the rhythm of their indigenously made drum. But now, this tradition has almost faded out, giving way to modern bands and fluorescent lamps. Devotees visit Krishna temples during this time and sing devotional songs, perform dances and play with abeer, wearing traditional white and yellow turbans. On the last day of this elaborate and colorful festival, large processions are taken out to the main Krishna temple near Imphal, where several cultural activities are held. The Yaoshang festivities have seen some changes in the past few decades. Now they also include some sport activities, interspersing them in-between the regular cultural events. This has now become tradition in many regions of the valley, with people of all ages participating with great enthusiasm, in a number of sporting events. Holi celebrations practically started in Gujarat. People here celebrate the festival with food, music, dance and by throwing Gulal on each other. This event is as big as Navratri is, for Gujaratis. In this community, Holi marks the start of the agricultural season, especially of the harvest of the Rabi crop. A bonfire is lit in the main squares of districts and villages and revelers gather around these fires, singing and dancing the night away. This day is celebrated as the victory of good over evil. Even those living in the tribal areas of Gujarat celebrate this festival with gusto. In the Ahmedabad region of Gujarat, a pot of buttermilk is hung at a high level on the streets. Young lads form human pyramids in order to reach the handi (pot) and break the same. Girls try to stop them from achieving their goal, by throwing colored water on them. This is done to commemorate the pranks of young Krishna, who used to steal butter from Gopis' homes and harass them by breaking their earthen water pots by throwing stones at them. The boy who manages to reach the handi and break it is crowned the Holi King for that year. The entire team of boys then takes a long procession around the area to announce their victory. In some regions of Gujarat, the ladies of the household pretend to beat up their brothers-in-law, who try to drench them with colored water pichkaaris (water guns). The latter then bring their sisters-in-law sweets in the evening. In the state of Maharashtra, Holi is predominantly associated with Holika Dahan. The Holi Purnima is also referred to as Shimga. Starting as early as a week before the festival, youngsters go around, collecting money and firewood. On the day of Holi, all the firewood thus gathered is arranged in a huge pile at a big ground or open community space. A bonfire is lit in the evening and each household offers a meal and a dessert to the fire god. Puran Poli is the main delicacy make during this festival. This is a favorite of the children, who dance around in gay abandon, chanting, "Holi re Holi, Puranachi poli". This festival of Shimga is associated with the elimination of evil and the victory of good. In this particular region, celebrating with color traditionally occurs on the day of Rangapanchami, which falls 5 days after Holi. On this day, people choose to forget their rivalries and enmities and get together to start afresh, building healthy relations with one and all. The Holi festival in Goa is part of the Goan or Konkani spring festival, referred to as Shigmo or Shishirotsava. A major festival among the Konkani community, it lasts as long as a month. The day of Holi is celebrated on one of these days during this month-long festival. On the day of Holi, people include rituals such as the Holika Puja, Holika Dahan, Dhulvad or Dhuli Vandan, and Haldune, which includes offering yellow or saffron-colored gulal to the deity. In Karnataka too, Holi is celebrated with much fervor. In certain areas of Karnataka, children go around collecting money and wood for weeks prior to Holi. On the night of Kama Dahana, all this wood is assembled together and is lit to form the bonfire. The festival is celebrated for two days in this region. The women of each household prepare feasts and the whole family enjoys it together. In Andhra Pradesh, the Festival of Colors is celebrated along with Basanta Panchami. In the Telangana region, and especially in Hyderabad, which has an undeniable Mogul influence, Holi is celebrated with much gusto and the city dons a festive look days before the actual holiday. Holi is not celebrated with must gusto in Kerala, except in some pockets, which are concentrated with some particular communities of people. In the Mattancherry area of Kochi reside 22 different communities living together in total harmony, enjoying their diverse cultures, spreading around joy during festivals and occasions. One such community includes the Gaud Sarawat Brahmins (GSB), who predominantly speak Konkani. They celebrate Holi in Cherlai area of West Kochi in their own way. It is locally called Ukkuli in Konkani or Manjal Kuli in Malayalam. Konkanis celebrate it by visiting their temple that is called the Gosripuram Thirumala temple. Holi is also celebrated at some colleges down South, which typically include students from many religious and cultural backgrounds. All thanks to the world becoming increasing global each day, the festival of Holi has cast its cheer on many regions all over the world as well. Areas thickly populated with the Indian community have adopted this festival with the same enthusiasm that India has. In Nepal, this festival is also called the Fagu and is celebrated on the full moon day of the month of February or Falgun. This is considered as one of the major festivals of that country too, and is as important as the Dashain (or the Dusshera in India) and the Tihar (Diwali in India). Nepal is predominantly populated by Hindus and hence, Holi (which is celebrated as a national festival in Nepal) and the other occasions too, are celebrated with much fervor by all the communities, including the Muslims and Christians, in that country. Revelers believe that playing with various colors takes all of life's sorrows away and make's one life as vibrant as the colors of Holi. Like in India, people celebrate Holi by spraying colored water or lolas (water balloons) on each other and also by exchanging colors. Again, like in North India, people sometimes mix bhang in drinks and food items, as is also done during the festival of Shivaratri. There are large pockets of Indians in almost every state of the United States of America. This fact contributes to a great deal of revelers celebrating Holi in this nation. Indians residing in the States celebrate all festivals, in order to stay in touch with their own national and cultural roots. During this time, huge Holi meets are organized, with people getting together to eat, drink, dance and sing. States such as New York and New Jersey, which have the maximum Indian population, practically come alive during this season. People also conduct Holi parades, fashion shows, music and dance competitions and so on. They sometimes even come out onto the streets and celebrate the festival with great joy and vigor. Bollywood actors and actresses are invariably invited each year to add more glamour and show to the festivities. Indian communities get together to celebrate this festival in the United Kingdom as well. Indians constitute the largest ethnic minority in this country. Holi celebration in the British city of Leicester is particularly worth the mention. Here, children spray each other with colored water. Holi parades are conducted in the evening and people visit their family and friends in the evening, exchanging sweets and greetings. The tradition of applying Tilak on each others' forehead is still very much prevalent among the Indians residing in this country. Phagwa is celebrated in all these countries as well. In Trinidad and Tobago, it is celebrated on the Sunday which comes closest to the actual date of Phagwa. People throw color at each other and there is a lot of singing and dancing of Chowtaal or Phagwa songs, which follows after. Guyana too considers Phagwa as a national holiday. On this day, people from all races and religions join to take part in the elaborate celebrations. This event is most vibrant in Georgetown, where there is a concentration of Indian communities. Elaborate arrangements for this festival takes place at the well-known Mandir in Prashad Nagar. The traditional Holika Dahan ritual so closely associated with Holi festivities is now being viewed as a serious environmental issue today. Experts aver that cutting wood for creating the bonfire is heavily contributing to deforestation. In one single season, approximately 30,000 bonfires are created, each requiring almost 100 kilograms of wood. Many have suggested alternative methods to using wood, such as burning waste material, using otherwise useless dry leaves, and lighting smaller fires and so on. However, many rural sections of the populace are against it, since it deviates from their age-old traditions. There is also the issue of water wastage during this festival, as also the dangers of using non-biodegradable synthetic colors. Natural colors derived from plant and vegetable extracts, sandalwood powder and oil and so on, had been used in the past to play a safe, environment-friendly Holi. But now, all this has given way to artificially-produced synthetic colors and chemical dyes. This causes both environmental pollution as well as eye and skin problems due to the allergens contained therein. According to some reports, certain synthetic colors were even capable of severely impacting health. For instance, the black-colored powder was found to contain lead oxide, which could potentially lead to renal failure. The blue powder could cause dermatitis, while the addition of copper sulphate in the green powder resulted in eye infection, even leading to temporary blindness in certain cases. Considering the ill-effects of playing Holi with artificial colors and dyes, several groups in bot Delhi and Pune started promoting the use of natural colors, in order to ensure a safer and happier Holi. These organizations are trying to promote awareness among children, also teaching them to make their own colors in the natural way. Other organizations such as the National Botanical Research Institute are now marketing herbal dyes, which are chemical free. 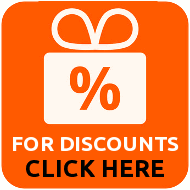 However, these are expensive and hence, not very viable for users. In most parts of rural India, though, people mostly use natural colors to play Holi with. Holi 2013: When Does this Day Fall? This year, Holi falls on Wednesday, March 27. Holi celebrations will hence continue for two days, that is, until Thursday, March 28, 2013. Enjoy the Festival of Colors to the hilt this year and all the years ahead. May you have a safe Holi and may Lord Krishna bestow His grace upon you and your family. Wish you a very Happy Holi!